The bank said the closures are a result of the collapse of plans to float off a new "challenger bank" under the name Williams & Glyn. But it said that there will be no further closures "until at least 2020." An RBS spokesperson said: "As we are no longer launching Williams & Glyn as a challenger bank we now have two branch networks operating in close proximity to each other in England and Wales - NatWest and Royal Bank of Scotland. "As a result we have reviewed our overall branch footprint in England and Wales and have made the difficult decision to close 54 Royal Bank of Scotland branches." The bank promised to "ensure compulsory redundancies are kept to an absolute minimum". But the Unite union described the closures as "disgusting". Rob MacGregor, Unite national officer said: "It is utterly disgusting that Royal Bank of Scotland has the audacity to announce that yet more important local bank branches will permanently close their doors." He said the announcement heaps further misery on communities across England and Wales "that have already seen the demise of local banking services". When RBS announced a previous round of closures, it pointed to nearby branches that would still be available to customers. Now those branches are "suffering a similar fate," he said. He added: "The disabled, elderly and many local businesses will today be deeply disappointed that their bank has chosen to withdraw from their community and no longer provide them with the access to banking services which we all deserve." The January 2019 move follows the closure of 109 branches in July and August, and is on top of a further 53 branches due to close in November. 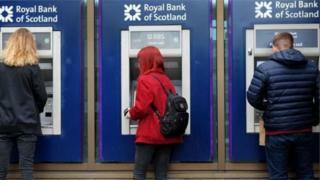 It will leave just 54 Royal Bank of Scotland branches in England and Wales. The spokesperson added: "Customers of Royal Bank of Scotland in England and Wales will be able to use NatWest branches and local post offices for their everyday banking needs. "We will now focus on investing in our Royal Bank network in England and Wales to make sure customers have a consistent range of products and services wherever they bank, be it Scotland, England or Wales."